Apple CEO Tim Cook: 'I'm proud to be gay' - Exam News, Reviewer, Military Career, & Everything [MN] . .
'Let me be clear: I'm proud to be gay, and I consider being gay among the greatest gifts God has given me' , this was a shocking statement made by the Apple Chief in a Bloomberg Businessweek column last Thursday. The first time the Apple CEO acknowledge publicly that he is gay and he explain why decided to come out. Cook, who grew up in Alabama, said he has long been open about his sexual orientation,but had just not previously discussed it publicly. 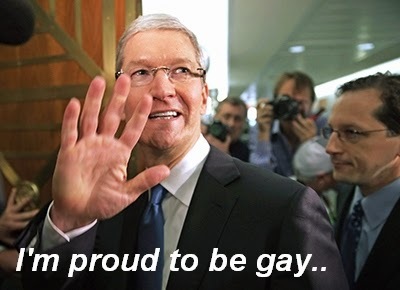 Allegedly before the Apple Chief comes out there have been some rumors and speculation that Cook is gay. In the Out Magazine’s 2013 power list he was name as the most powerful LGBT person CNN report said. A year ago, Cook announced support for a federal law which would have protected workers from facing discrimination based on their sexual orientation. "I have seen and have experienced many types of discrimination, and all of them were rooted in the fear of people that were different than the majority," he said in that speech. Video courtesy of USA Today via Youtube.